The Center for Creative Leadership’s Sara King and Northwestern University professor Alice Eagly examine the obstacles, pressures and trade-offs women face at every stage of their careers to analyze the reason that only three percent of Fortune 500 leaders are women. • Take risks, accept challenges to demonstrate adaptability, versatility. Communicate willingness to change jobs and take on special projects to gain experience. Learn from research findings that women are not viewed as promotable if they stay in one area of expertise or have a narrow functional role. 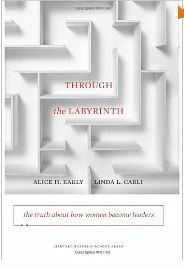 Through the Labyrinth: The Truth About How Women Become Leaders. Alice H. Eagly Linda L. Carli, 2007 Harvard Business School Press. The Center for Creative Leadership showcased related research that identified five themes among high-achieving women: agency, authenticity, connection, self-clarity and wholeness. Authenticity, being genuine, being yourself by developing self-awareness to clarify values, preferences, skills, acceptable trade-offs and acceptable sacrifices. Connection, by taking time for people, to build personal and professional relationships, networking, finding a mentor, establishing a personal “board of directors” to provide support and feedback. Self-clarity from seeking feedback and reflecting on one’s values, motivations, behaviors, strengths, weaknesses, impact on others. This is a continuing process of evaluating changes in your needs, motivations, goals, values, while observing patterns, and being open to possibilities. Wholeness from seeking roles beyond work or to unite different life roles, by prioritizing commitments and saying “no” to low-priority roles or obligations. -*What solutions have you seen most effective in navigating the challenges facing women seeking leadership roles? This entry was posted in Behavior Change, Business Communication, Career Development, Leadership, Resilience, Thinking, Working Women and tagged Alice Eagly, Behavior Change, Bias, Business Communication, Career Development, Center for Creative Leadership, Discrimination, Leadership, Sara King, Thinking, Work-Life, Working Women on May 27, 2012 by kathrynwelds.